Once again the new normal in winters is proving itself to be completely abnormal. 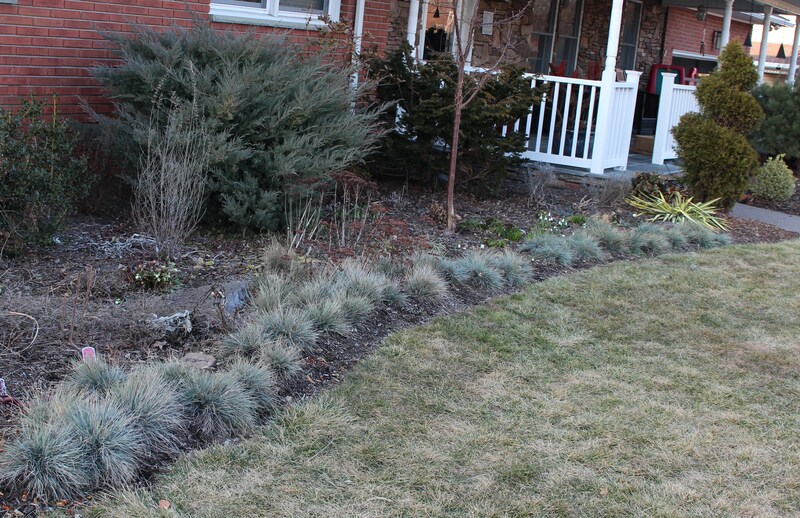 Instead of celebrating the depths of winter last week with a warm blanket and a seed catalog I found myself outside in the sun clearing dried stems from around snowdrop sprouts and spreading mulch and compost on top of the earliest spring flower beds. I loved it for a few days, but to see snow and freezing temperatures in the week ahead was much more reassuring, if only to keep the flowers asleep until safer weather returns. 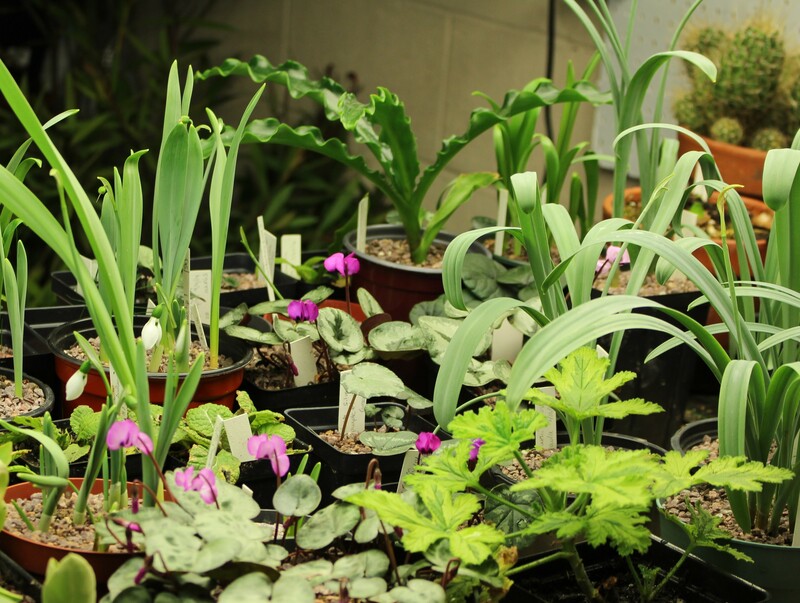 It is winter gardening season after all, and the 2017 winter garden has been up and running since the holidays. The cool (but rarely freezing) workshop which adjoins the back of the garage is home to my often celebrated winter garden. 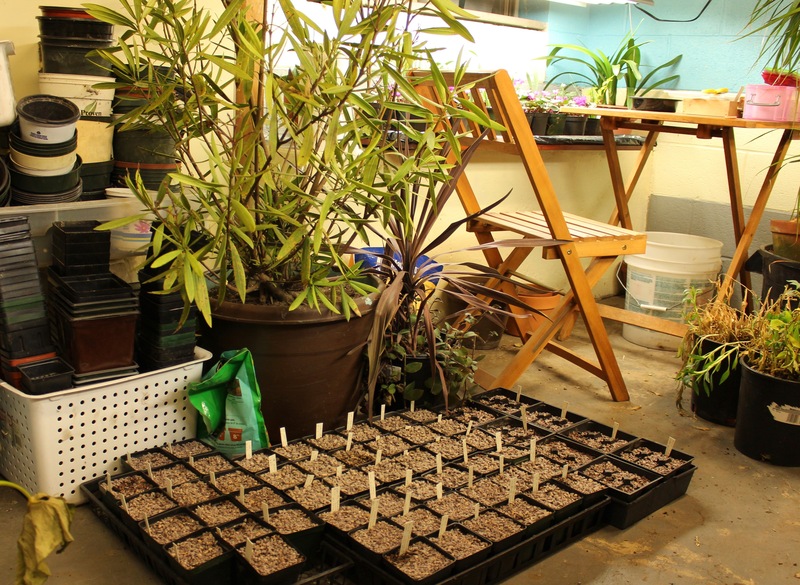 A collection of overwintering bulbs and potted plants survive the cold in this dimly lit room, and each winter they are joined by a table top full of forced bulbs, early seedlings, and whatever else I can’t leave to freeze outside. I’ve upped the number of fluorescent light fixtures to three this year and am feeling rich with all the extra growing space! 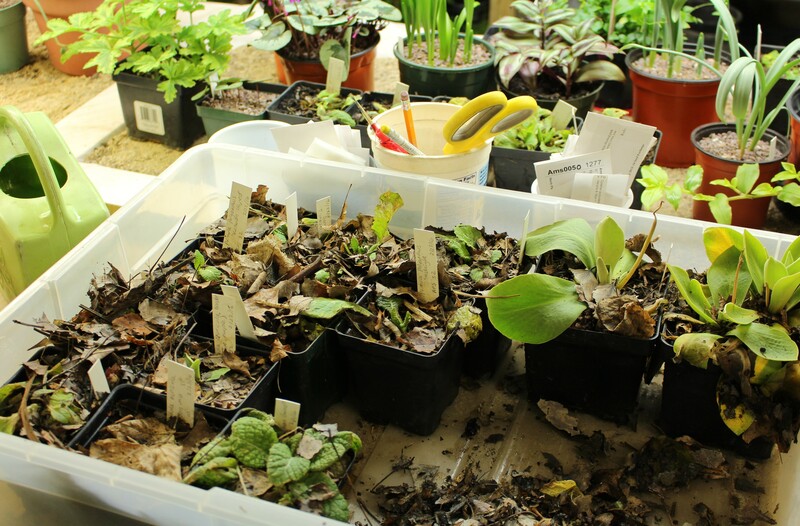 A closeup of the different foliage types filling the table. 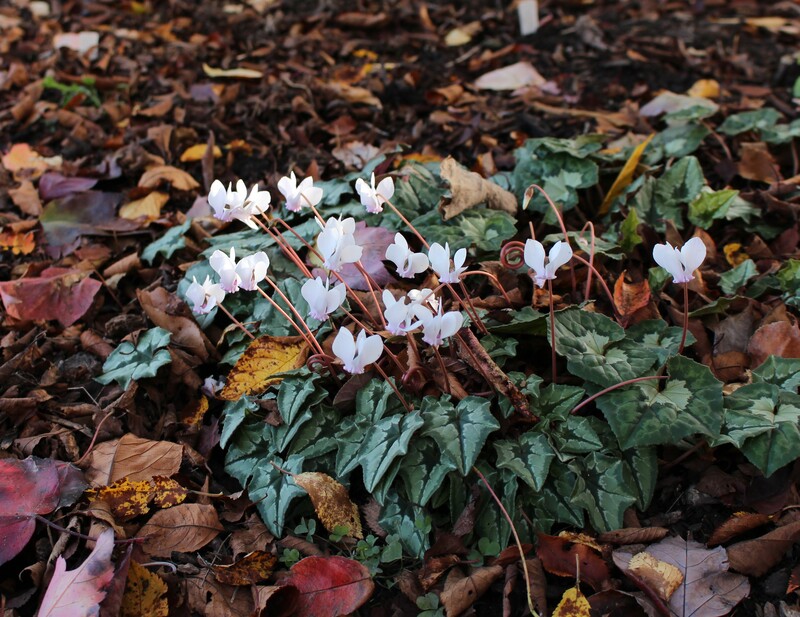 Snowdrops and cyclamen dominate, the cyclamen are only just starting to put out their midwinter flower show. 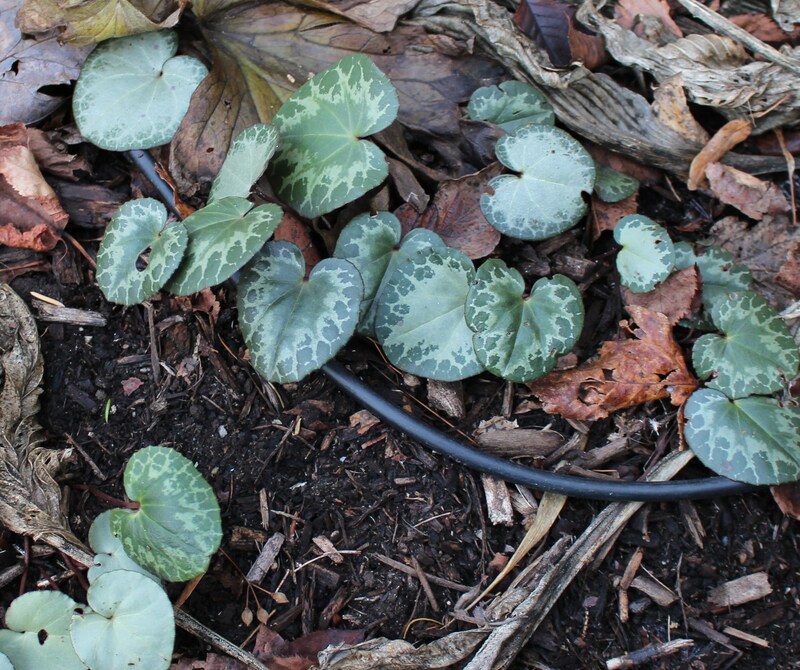 Interest in the winter garden rises and falls opposite the outdoor temperatures. 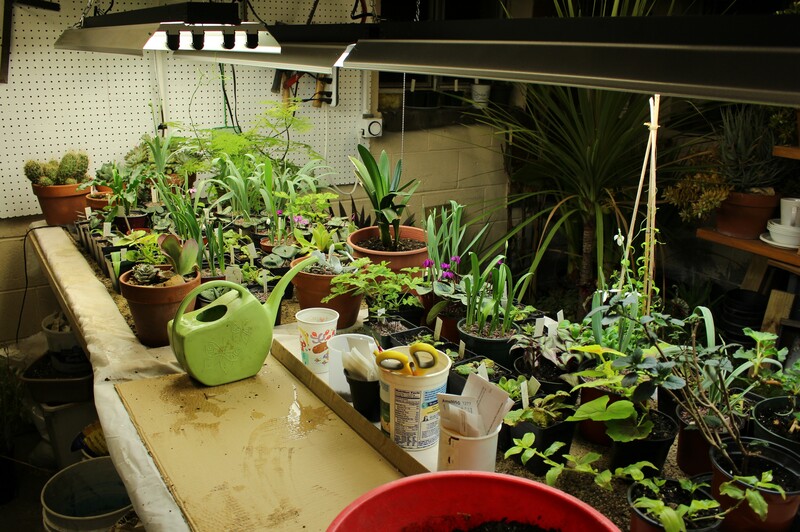 Colder weather means more tinkering indoors, warmer weather results in general neglect. 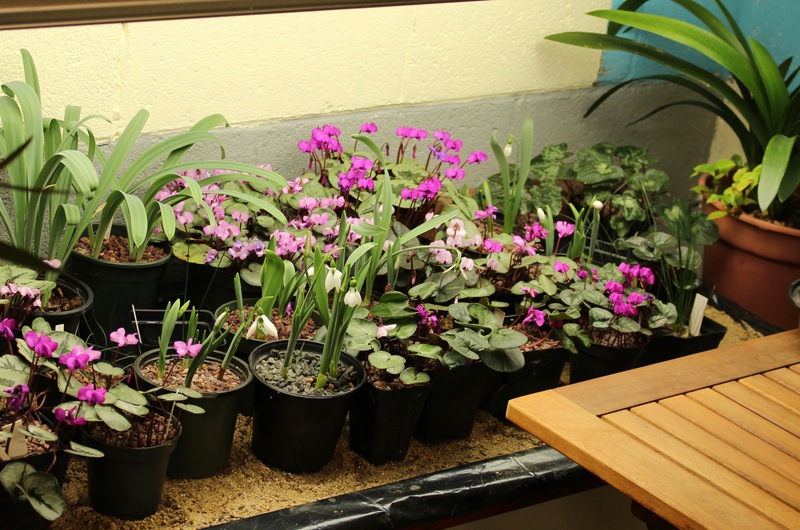 This week I bucked the trend though, and brought in a tray of primula seedlings before the approaching snow and ice locked them up in their protective mulch pile. With just a little cleanup I’m optimistic these primroses will look great. Hopefully blooms will show up in just a couple weeks under the lights. Three plants have become standards for my winter garden. Snowdrops are the first. They’re an addiction so I can’t really reason out why I must grow them here when they’re just as successful (and nearly at the same stage) as under lights… but I do. Cyclamen and primrose are a different story. Their bright colors and their overall happiness in this cold back room really cheer up a gloomy winter evening and make this my new favorite place for sorting seeds and planning the new season’s garden. Each year the winter garden room gains a little more street credit. Maybe someday I can be surrounded by aged terra cotta and antique garden décor, with a few rustic signs which say ‘garden’ or something similar…. Maybe. Either that or a beer tap. As I hide out in my man cave it gives me the necessary time to fully enjoy the snowdrops and other goodies which are coming along under lights. 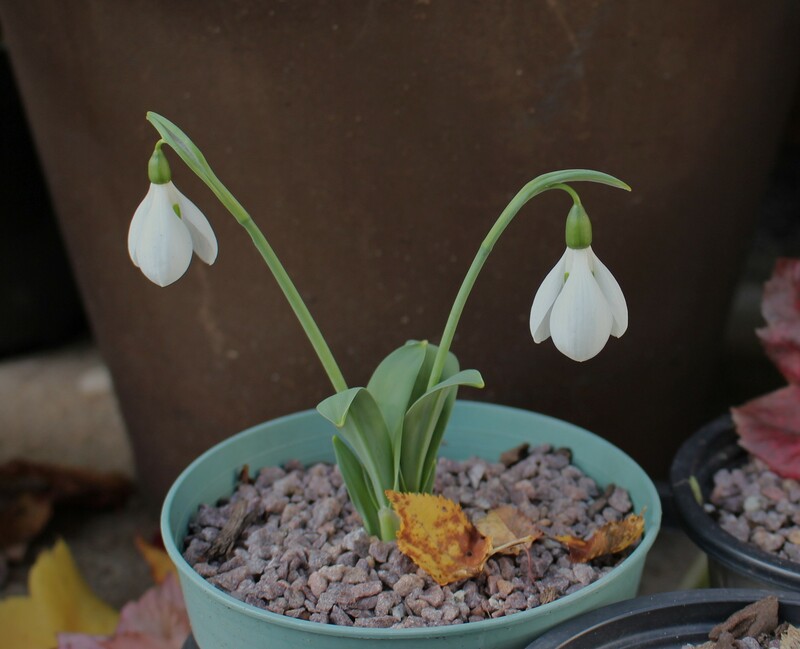 The bulk Galanthus elwesii which I bought as dried bulbs and potted up for forcing have given me a few nice surprises, but I will spare you from most of those photos. Here’s one though which I will put in, it’s a particularly tall one growing alongside a peculiar climbing asparagus which I grew from seed last winter. Asparagus asparagoides is a noxious weed in several tropical areas outside its native African range, but here under growlights in Pennsylvania I think we’re safe. To be honest there’s nothing really special about it, except that it’s super special… if you know what I mean. 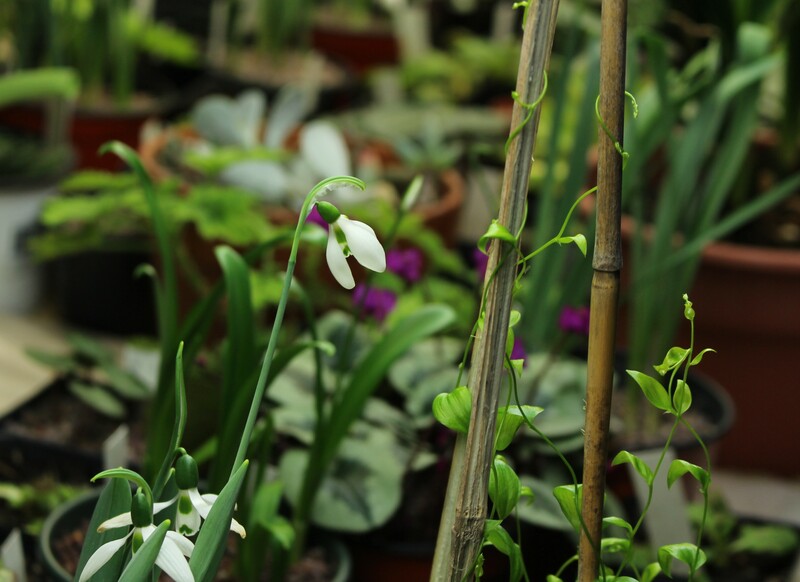 Snowdrops and the climbing Asparagus asparagoides. I don’t think the asparagus would be hardy outdoors, which is probably a good thing. A particularly nice snowdrop with average markings but a second scape (extra flowering stem) coming up, and a third flower coming up off of a side shoot. 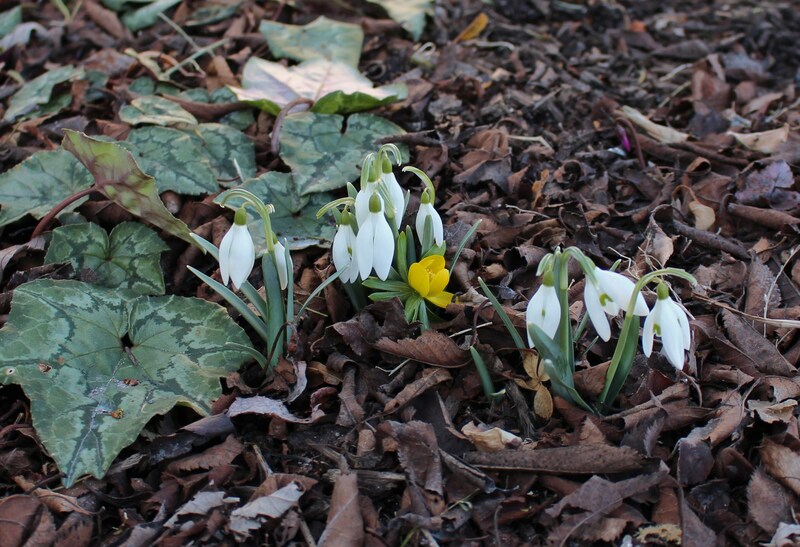 A snowdrop which puts out three flowers is a good thing in my opinion. Until the cyclamen get into full bloom and the primroses burst into flower I’ll just give an update on the hyacinths I potted up just before Christmas. 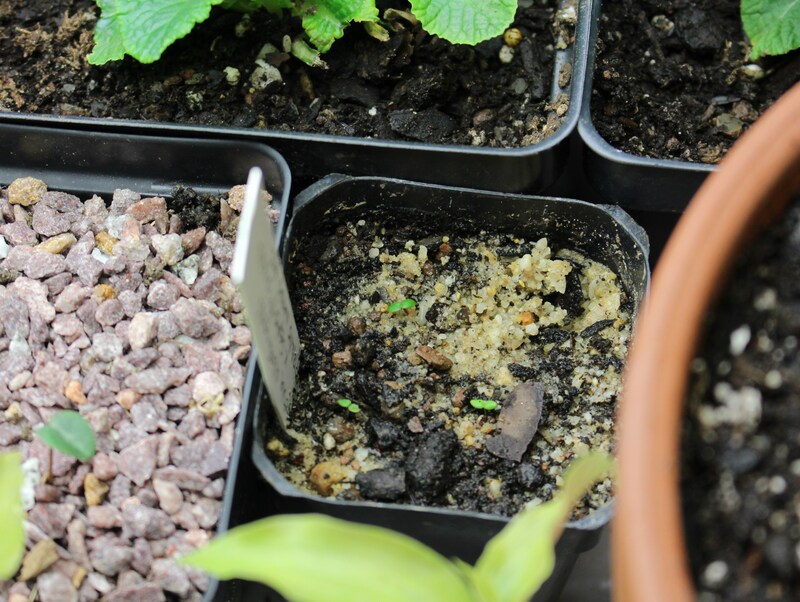 They’re starting to sprout and I’ve moved them onto the coldest windowsill of the workshop for some light. Once the flower stems start to come a little more I’ll move them under the grow lights as well. The fragrance of hyacinths will be a nice addition to the winter garden. The poorly insulated, dirty glass of the shop windows is as close to a coldframe as I’ll get this year. 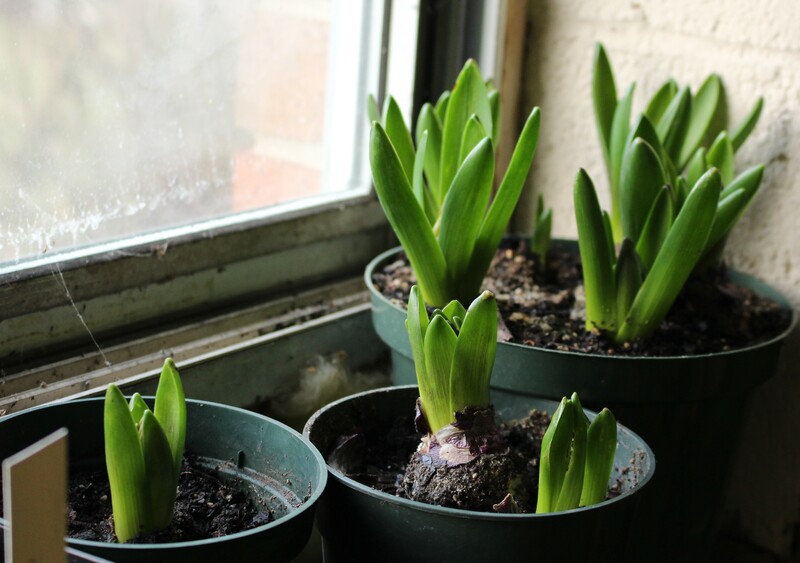 The bulbs don’t seem to mind though and the cool temperatures keep the flowers from opening up too fast (before they’ve sprouted up out of the bulb). So that’s where the winter garden is this year. I planted onion seeds yesterday and in my mind the primroses already look as if they’ve grown a bit since coming inside. It’s exciting but also dangerous to start so early on that tricky road to spring fever, but maybe the next four days of below freezing weather will help. 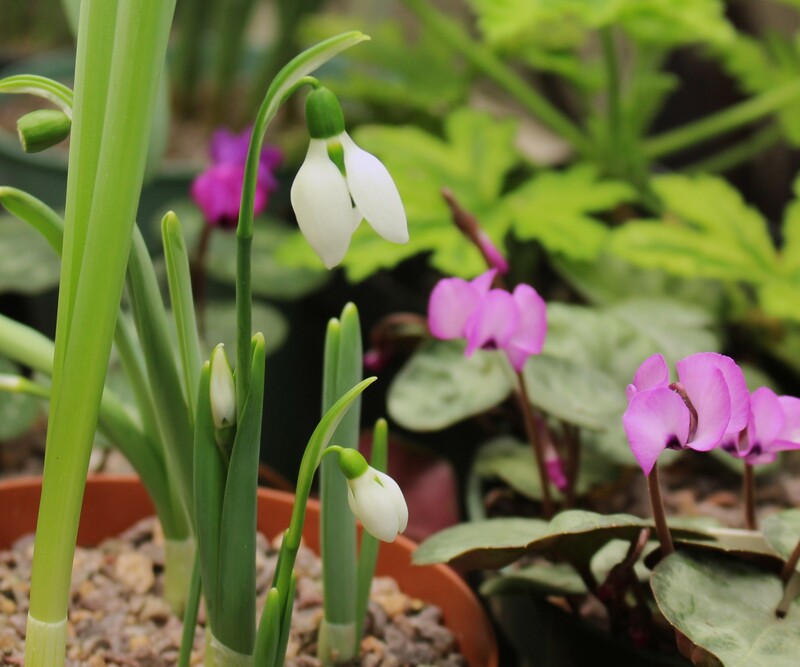 I’ll just need to ignore the fifth day when the high is predicted at 50F (10C)… a temperature too high for February and one which is sure to bring on the first outdoor snowdrops. There’s an impending air of doom hanging over the garden, and the threat of next week taints everything. The Cubs winning the World Series was likely the first sign of the apocalypse and now I can only imagine what next Wednesday could bring. Our current stretch of warm weather has me even more nervous since as we know from high school science, freezing is an exothermic process and on the chance that Hell has indeed frozen over science would predict that things up here on the surface would warm up as a result. 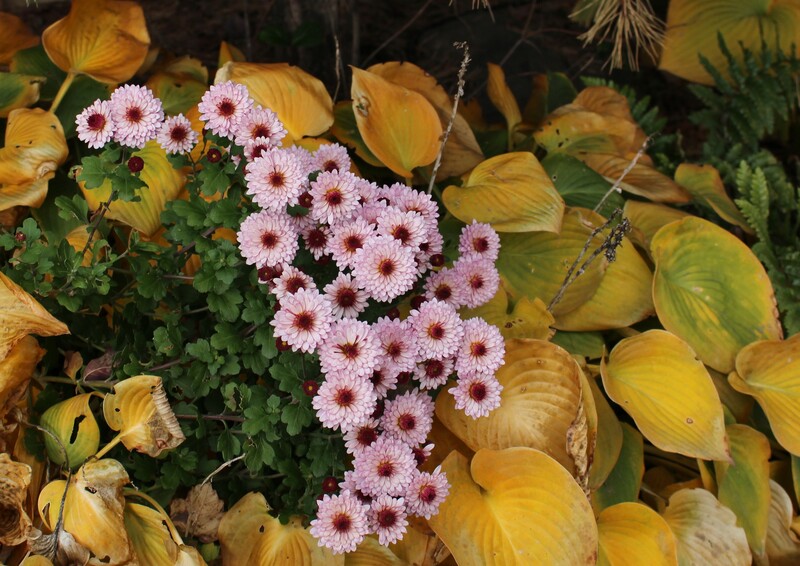 I’ve never hoped for a cold snap more, even if it means losing the last of the autumn flowers. The latest of my seedling chrysanthemums. This one’s not as hardy as the rest but does well enough up near the foundation. The last of the autumn leaves are really hanging on in the warmth. This red maples along the fence is always my favorite with its sunset blend of reds, oranges, and yellows. As the days go on it will hopefully fade to pale yellow with red highlights before finally covering the lawn with a carpet of next year’s mulch and compost. 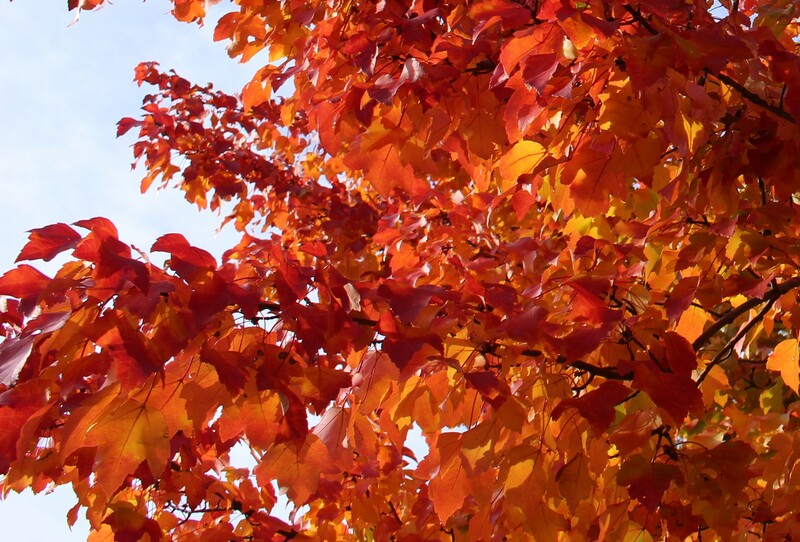 For most of the year I resent the greedy water stealing roots of this pesky red maple (Acer rubrum), but for a few days in autumn I forgive it and soak up every glowing minute of its final foliage show. Closer to the ground the earliest (or latest, depending on your perspective) bulbs are beginning to show signs of growth. My absolute favorite right this moment is the fall blooming snowdrop a friend of mine brought back for me from Nancy Goodwin’s Montrose Gardens in Hillsborough, North Carolina. I love a plant with a story and this one has a good one. 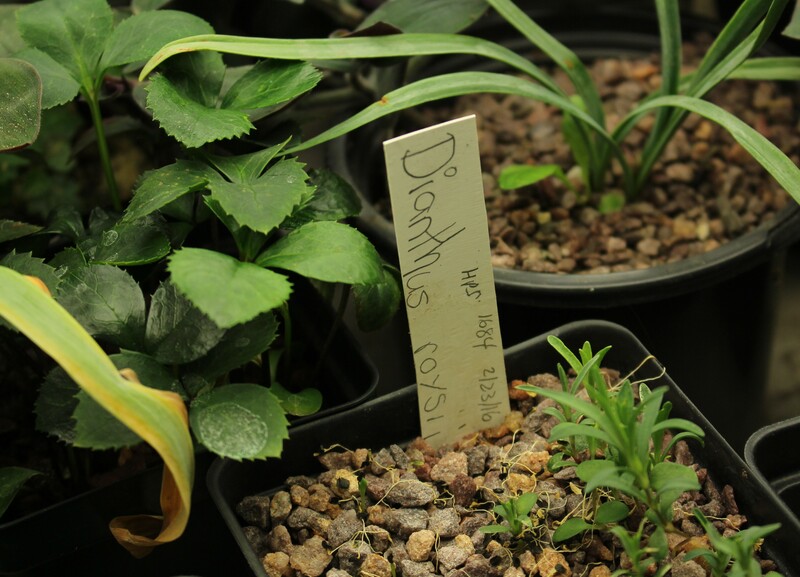 Its full name is Galanthus elwesii var. monostictus Hiemalis group ex. Montrose and to be honest I love writing that one out. It’s the nerdy Latin way of describing a fall blooming snowdrop with a single green mark that comes to me via Montrose Gardens. This one and its thousands of sisters are all the descendants of a handful of bulbs Mrs. Goodwin purchased decades ago at a local hardware store. They say the rest is history, but in this case it’s a history which required years of division and transplanting as the bulbs were slowly spread across her acres of woodland. The bulbs now make an unparalleled show each autumn around Thanksgiving and I wouldn’t rule out some day making the eight hour trip to see it in person. Such are the dreams of the obsessed, but if you’d like more information have a look at this NY Times article on a visit to the gardens, and also consider looking up Nancy Goodwin’s book “Montrose: Life in a Garden” for a monthly chronicle of the gardens. 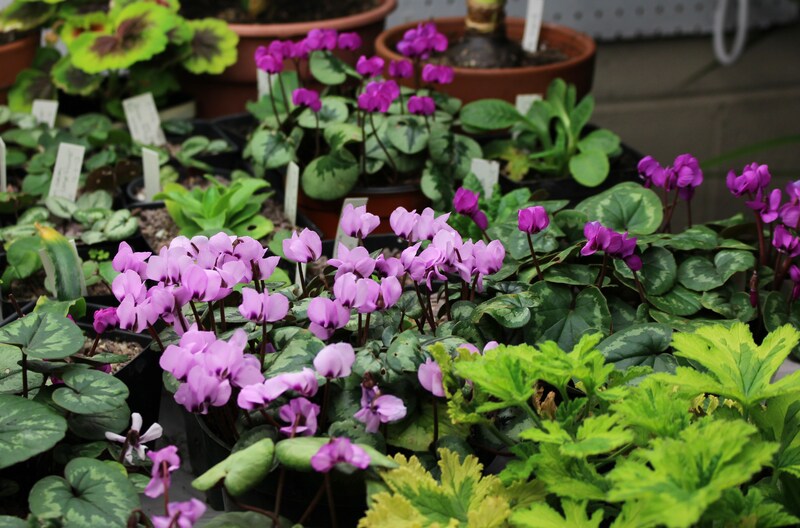 She was also a big fan of the Cyclamen family and grows thousands of them as well. That’s my kind of gardener. Galanthus elwesii var. monostictus Hiemalis group ex. Montrose. Yeah. 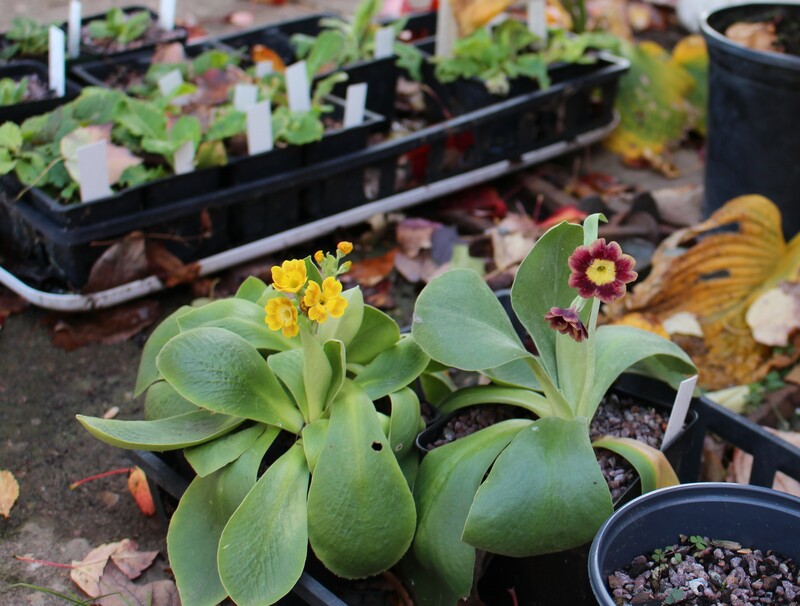 Besides fall blooming snowdrops, there was also an October surprise here when my two auricula primrose insisted on sending up a few autumn flower stalks. 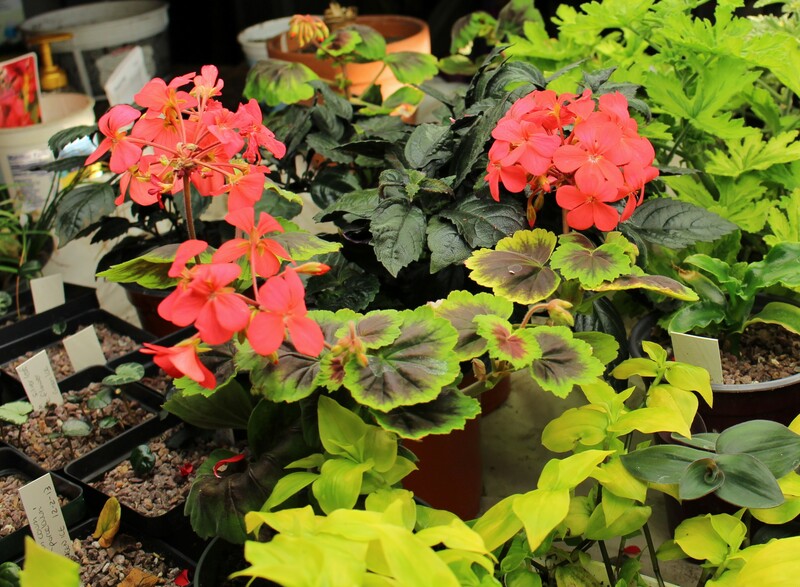 I’d rather they waited until spring since the flowers don’t look nearly as big or nice as the could, but my hope is they really liked their repotting and are only just ramping up to an even more amazing show in March under the growlights…. 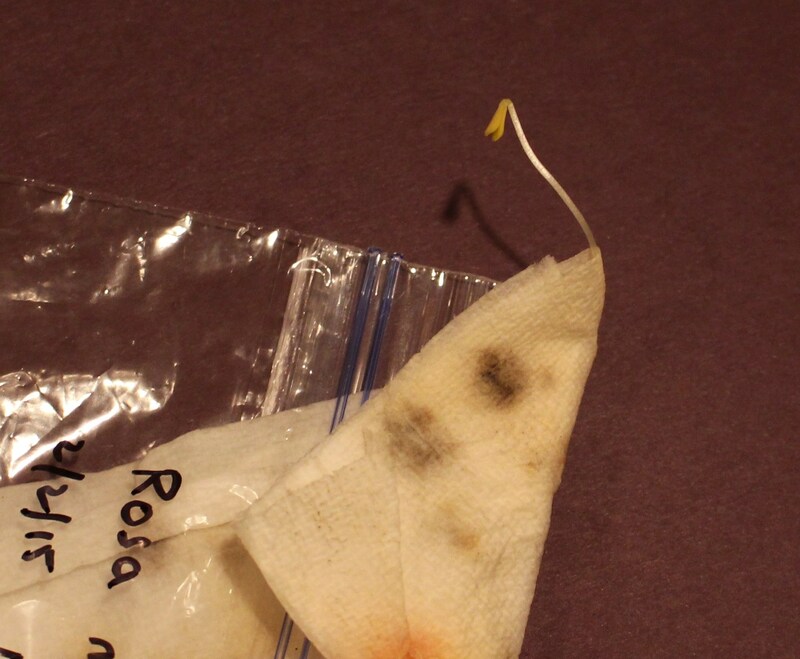 unless they’re planning on dying, which is always another possibility for plants in my care. A pair of primula. 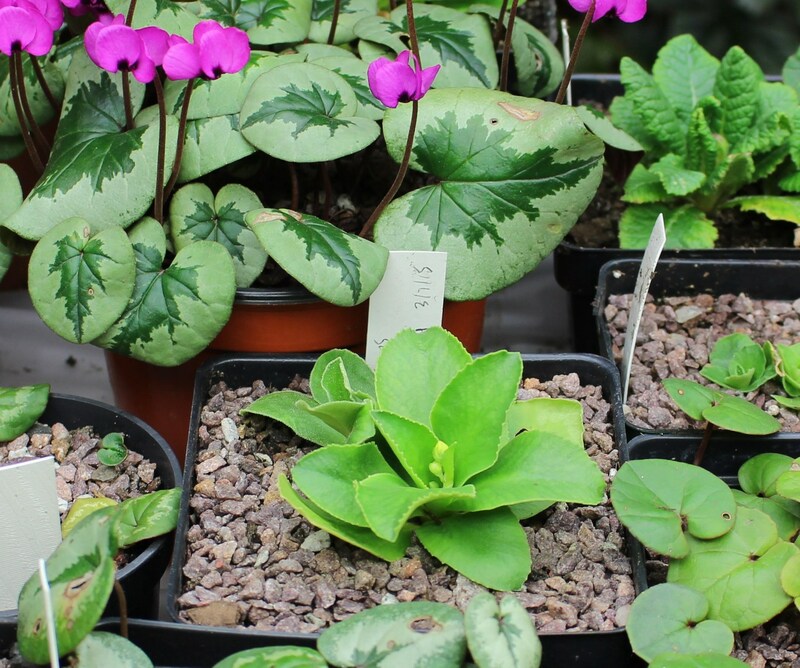 Primula auricula hybrids to be exact. The yellow had bloomed before but this is the first flower for the brownish one, and I’m pleased with the color. 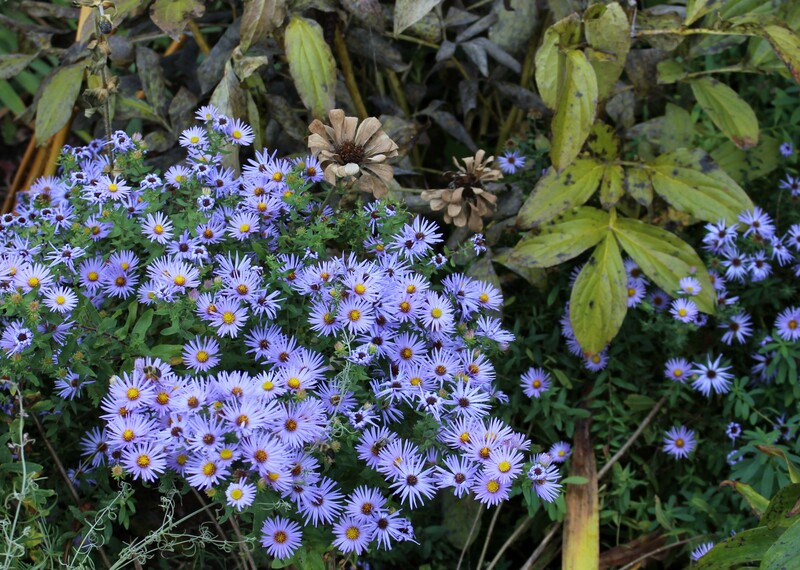 Some other final color in the garden is the Aster oblongifolius ‘Raydons Favorite’. It waits until the very end of the season and carries it out with a clear lavender blue color and attractive dark eyes as the flowers fade. I should really give it a little more room and respect next year, and not let it suffer all summer crowded and untended while the summer annuals steal the show. Amidst the mildew decay of fading peony foliage and frosted zinnias, Aster ‘Raydons Favorite’ offers up fresh color for this part of the border. I think more would be a good idea. 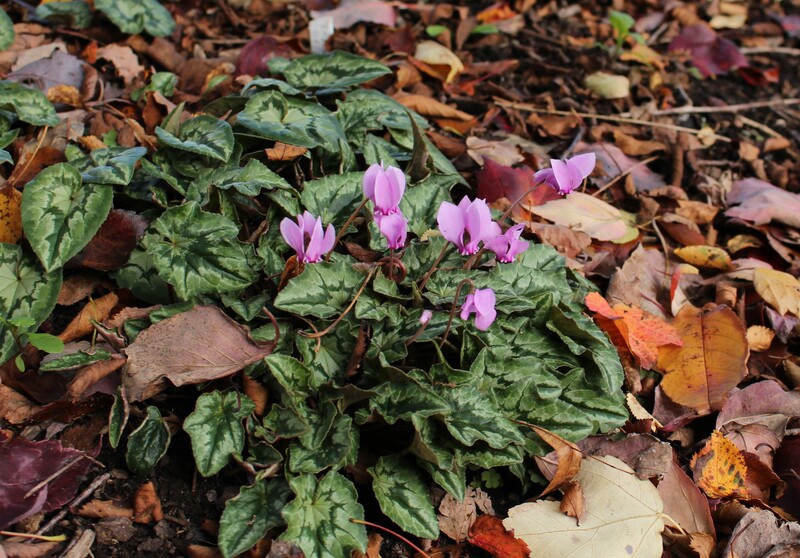 I can’t do a late fall post without slipping in a cyclamen or two. They’re sending out more and more of their beautiful foliage and while other parts of the garden are fading, these go from strength to strength. I may have to talk to John Lonsdale about adding a few new ones since you can never have too many of these treasures and he always seems to have a few special ones for sale at Edgewood Gardens. 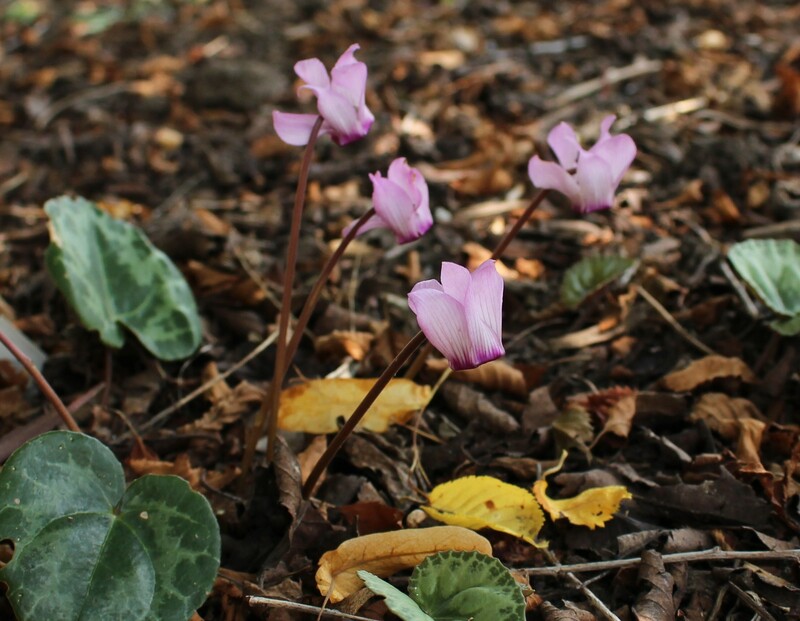 The hardy Cyclamen hederifolium starts flowering without foliage in late summer. I love it even more when the leaves begin to come up and there are still plenty of blooms to accent them. 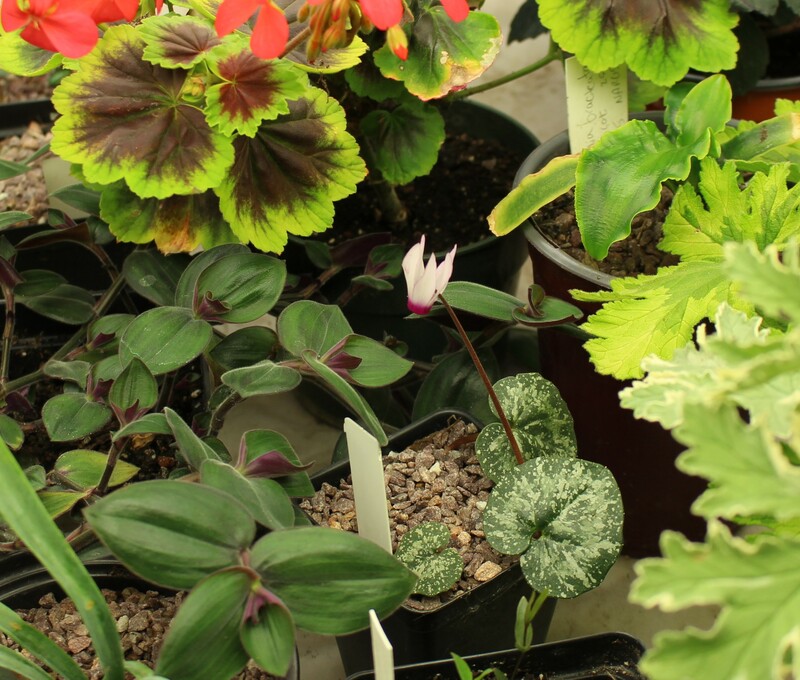 The range of foliage types in Cyclamen hederifolium is really outstanding. 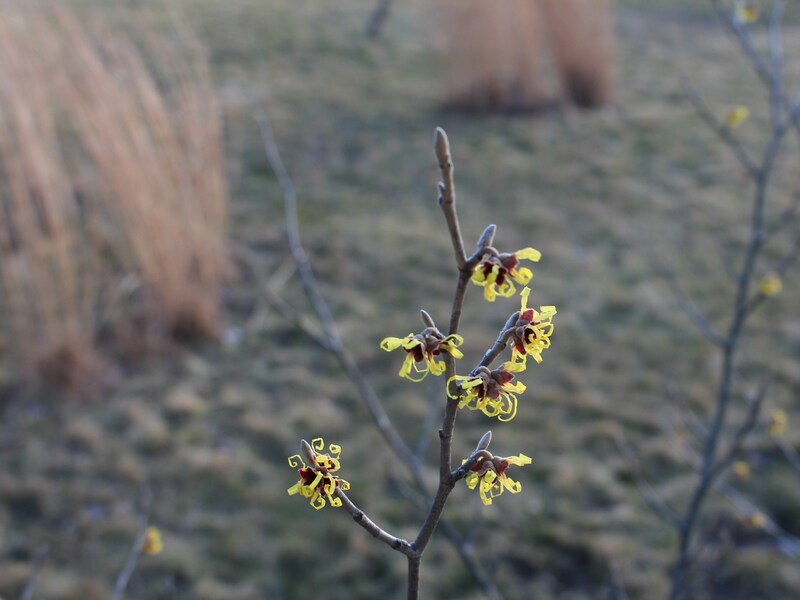 The dainty and distinct flowers are almost more of an afterthought. 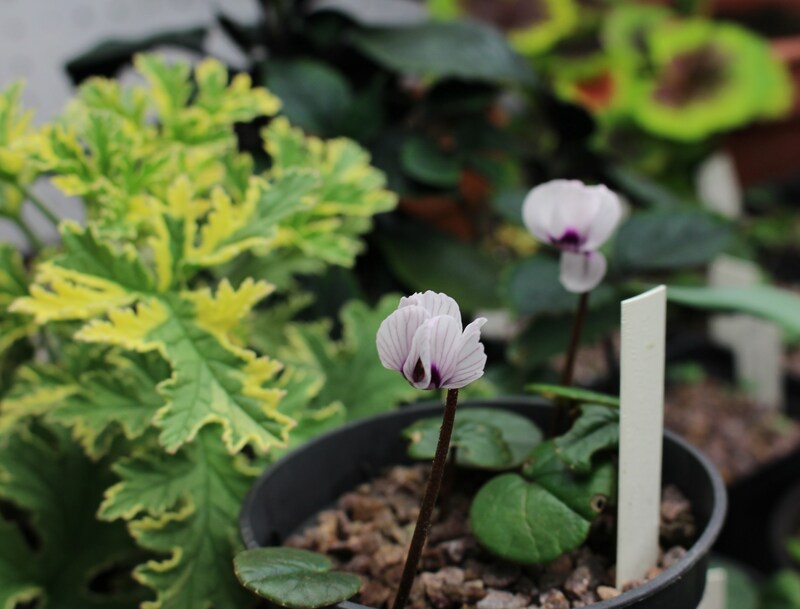 A pale pink form of Cyclamen hederifolium with a leaf pattern which I love. 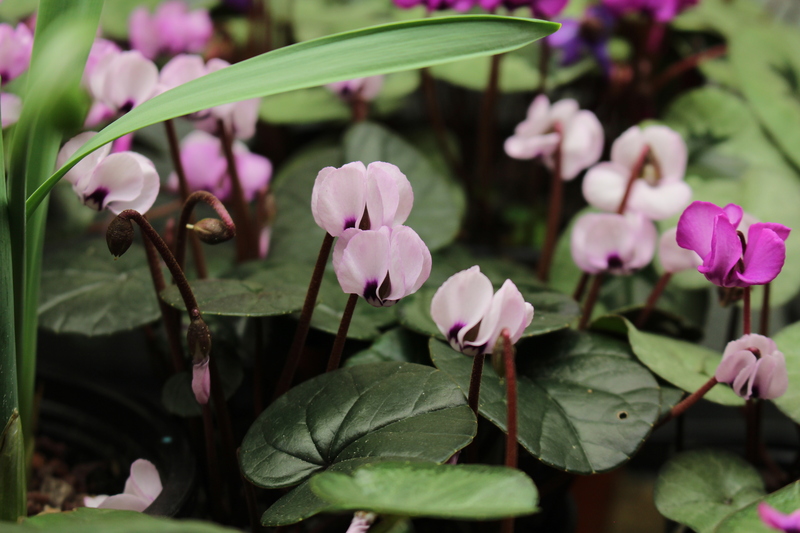 For the moment I may have resisted adding any new Cyclamen but don’t be under the false impression I’ve resisted all the other goodies which can be found during fall planting season… or even better found during autumn clearance sales. 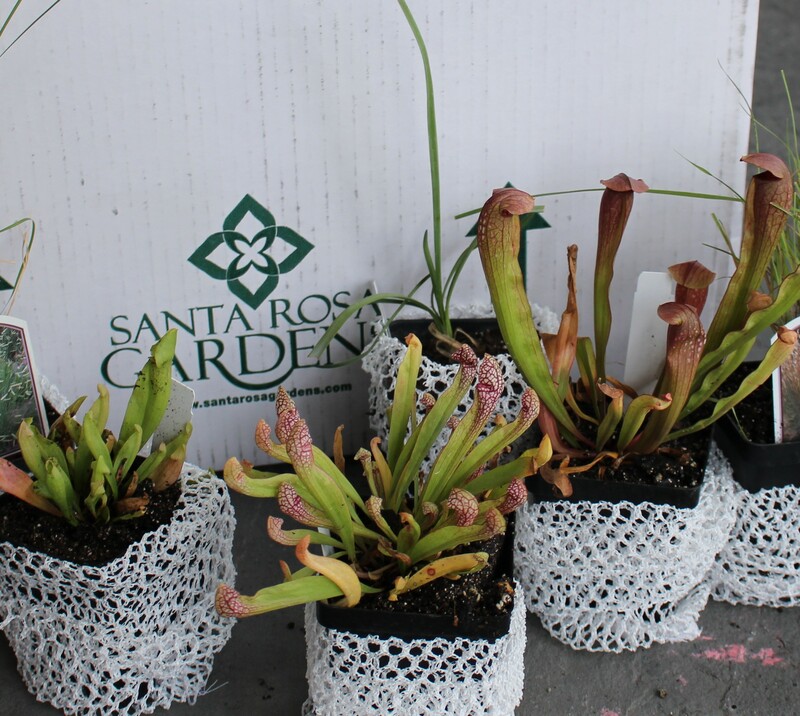 For some reason I found the Santa Rosa clearance sale (still going on btw, and don’t miss out on the additional 20% off coupon code) and discovered I needed more grasses and a trio of carnivorous pitcher plants. Who knew? Three new bog plants (Sarracenia) for the bog I don’t have. Hopefully I can keep them happy elsewhere since they’re so absolutely cool with their sinister insect trapping pitchers. As I go on and on about new plants I won’t even mention the tulips which need planting, the daffodils which need replanting, and the projects which need finishing before the bottom drops out of this pleasant autumn weather. Let’s hope that’s the only thing which the bottom drops out of this week. Ignorance is bliss. 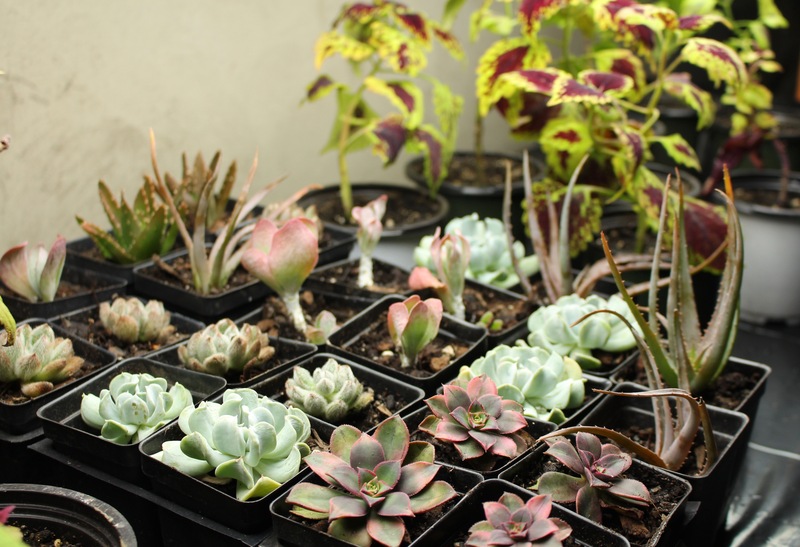 As the garden shivers and crackles under a freezing blanket of cold the wise gardener will hunker down indoors and enjoy the luxury of a warmer, climate controlled gardening experience. Outdoors he can’t do anything but wait for the damage to show but indoors he can at least tweak the thermostat a little higher and take another sip of coffee… spiked or unspiked depending on the latest weather report. 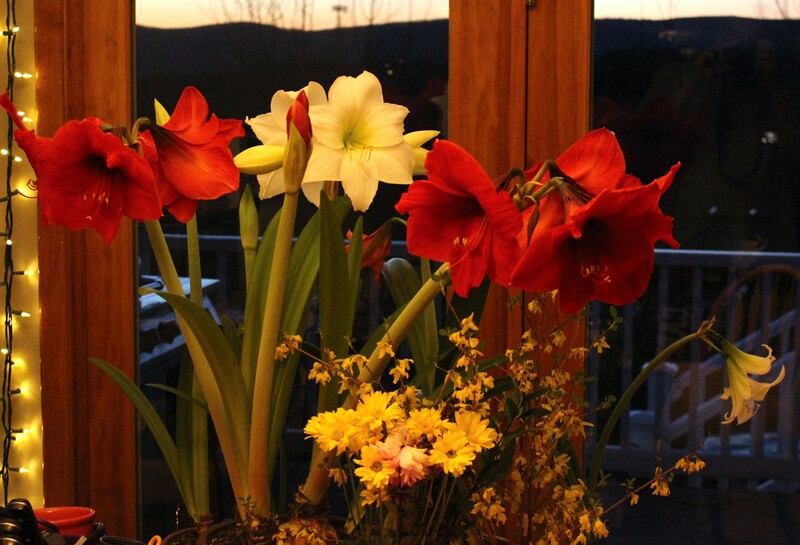 Leftover Easter flowers and a few too many amaryllis blooms. I’ve been a little too excited about the new amaryllis I bought this winter and in my excitement ended up bringing the older bulbs out and giving them a little water too. 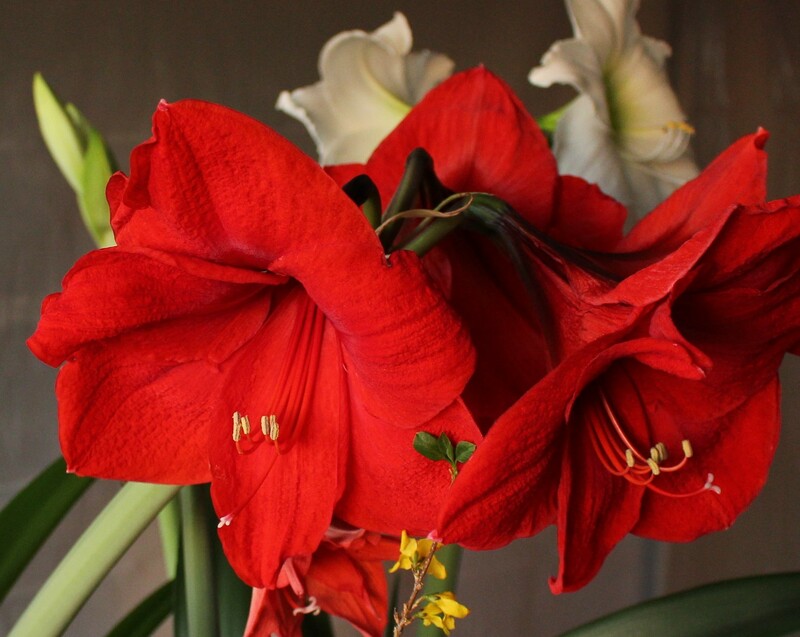 In a normal year I just throw the dormant bulbs outside in April and let them bloom right alongside the tulips, but this year I thought ‘the more the merrier’ and as a result I’m ending the winter with an amaryllis (Hippeastrum) extravaganza. I’ve had these bulbs at least seven years now and if I remember to give them a little attention after flowering they reward me each spring with a fantastic color show. It sounds slightly ungrateful but of all the colors, Christmas red and snowy white are not what I’m normally looking for come springtime. This of course was not what I was considering years ago when I picked the bulbs up for $1 a piece at some box-store clearance shelf… but please humor me as I shamelessly brag about how well they are doing now. Each pot is already showing at least four bloom stalks a piece, and the plants themselves are on the verge of nearly overwhelming the dining room table, even with less than half the flower stalks open. 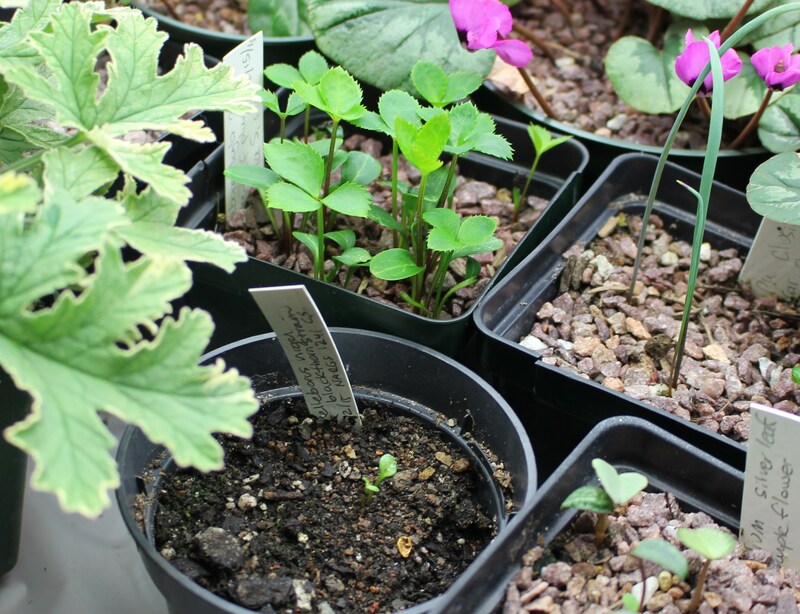 On the edge of the group you barely notice the last of the newbies, a delicate pink-flushed mini white named ‘Trentino’. Bigger may not necessarily be better as in the case of this ‘mini’ amaryllis ‘Trentino’. Once it warms up outside (assuming it ever does) new and old amaryllis will all go out into a semi-shaded spot, get hooked up to the same drip irrigation system that waters the summer annuals, and will be ignored until November. If I feel generous I’ll send some liquid fertilizer their way but for the most part they’re on their own. If there’s a trick to it all I guess it’s that they sit in a gritty, peat-free soil mix which drains well, and they have a nice solid terracotta pot which breathes well and holds down their heavy tops. Well drained, plenty of moisture, and a good feeding… mine enjoy that. 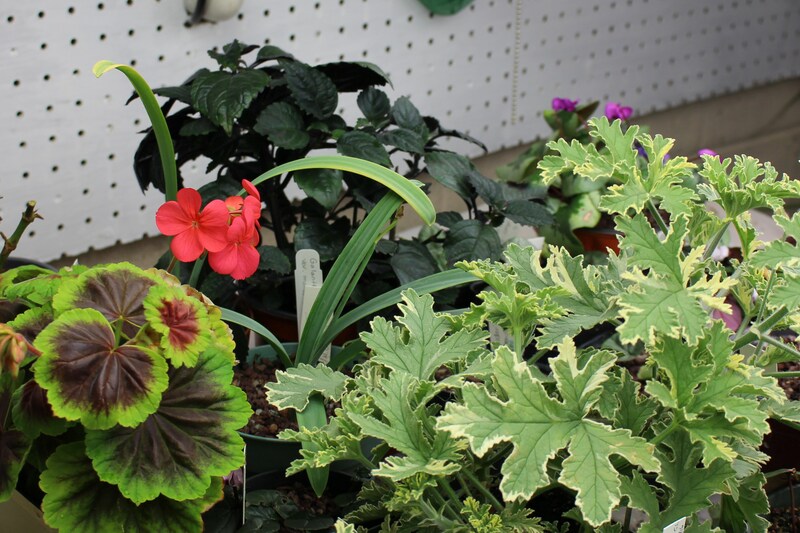 Geraniums blooming more than they should under the lights of the winter garden. A better gardener would probably remove the flowers for the sake of stronger growth and a healthier spring transplant. 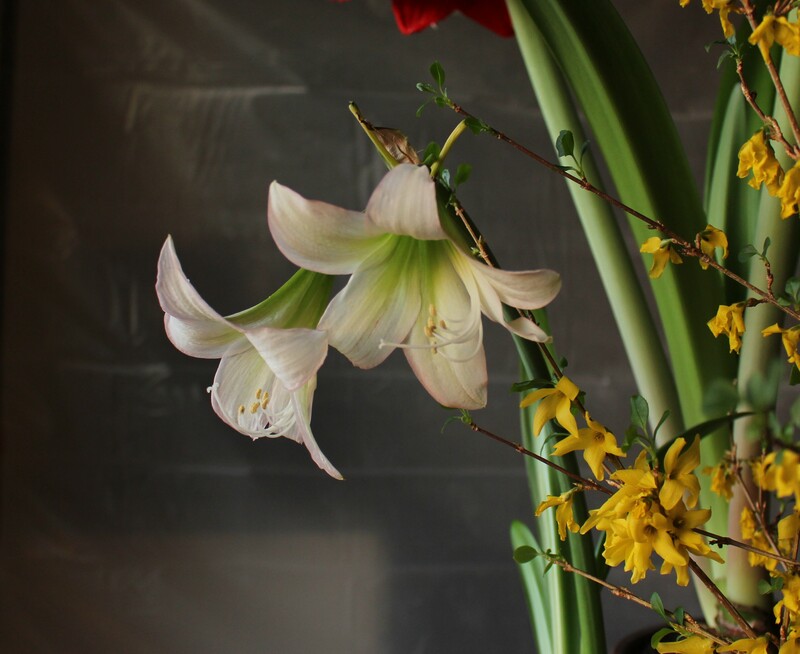 You may notice the attractive plastic sheeting which forms a subtle backdrop to the amaryllis photos. The sheeting keeps the dust and debris of a kitchen remodel from drifting into the rest of the house, and also keeps us from enjoying the charms of a useable sink or stove. If I try hiding indoors too long from the brutality of our latest arctic blast, eventually I need a new place to hide from the mayhem a kitchen run out of the living room…. 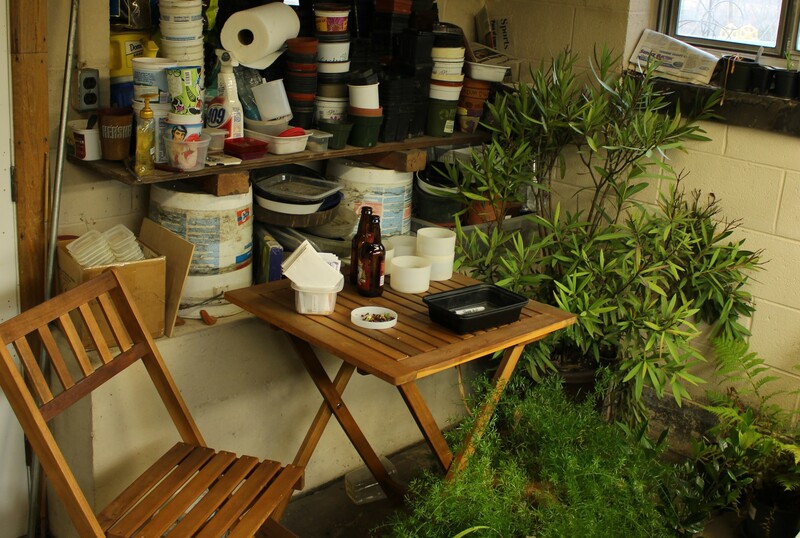 so I escape to the garage and the winter garden. 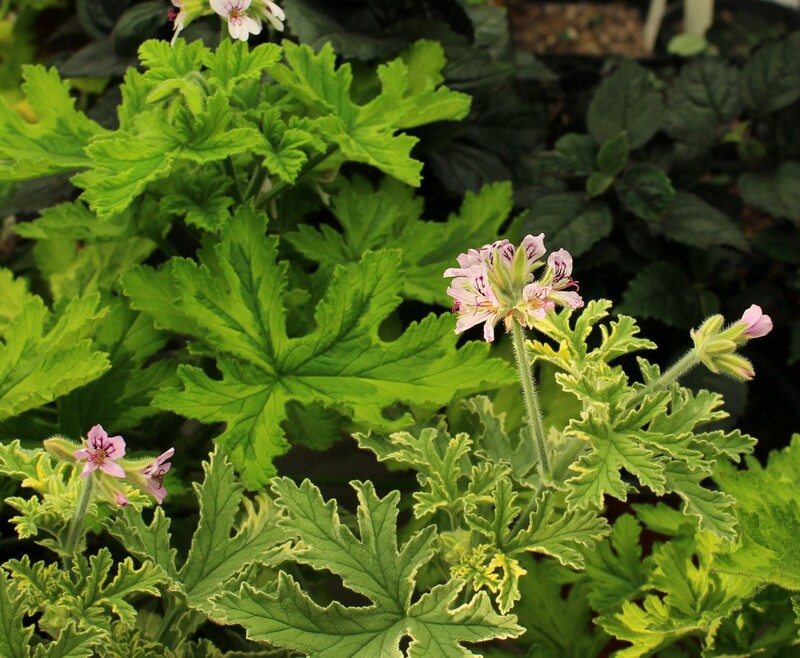 The scented leaved geraniums (Pelargonium) are also blooming under the lights. The flowers are a treat, but I love the lemony scents which come off the foliage each time I move a plant or water a neighbor. For a while the winter garden was being ignored. Spring was early and I was back outside enjoying snowdrops, then crocus, and then daffodils… but now winter is back and I’m pretending it didn’t all happen and I’m just doing the regular sowing and repotting of late winter. Because I foolishly brought sprouting bulb seedlings in during a December freeze I’m now at the point where I can dig seedlings out and see what grew. 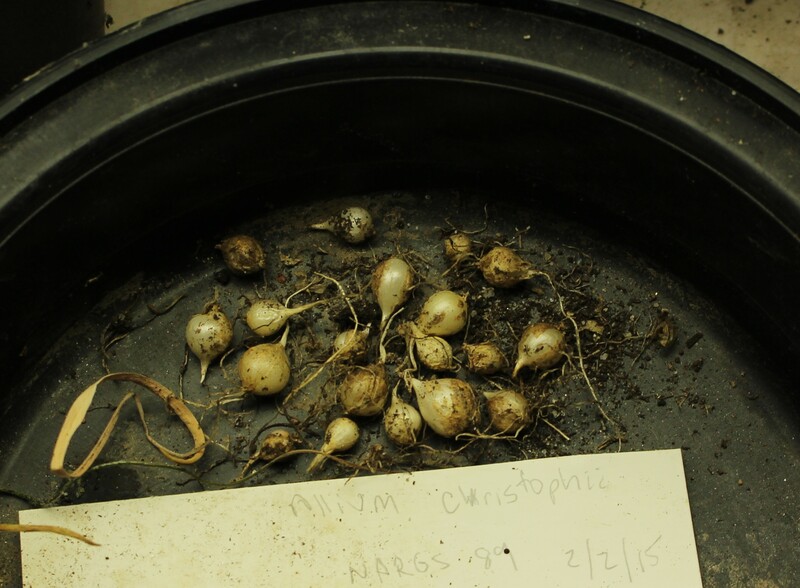 Here’s a mixed potful of one and two year old Allium Christophii bulblets which just recently went dormant. I’m fascinated even though a less than polite reader might point out I could get a bagful of blooming sized bulbs for under $10 this fall. 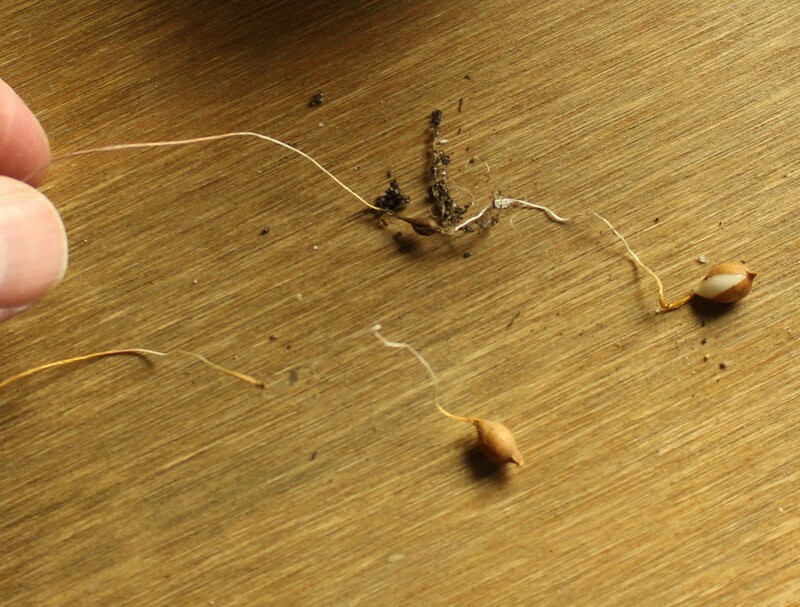 A few Allium christophii seedlings all grown up into pea sized bulblets. I’ll plant them outside next year and hopefully see flowers in another two or three years. I’m sure at that point I’ll wonder where they came from, since I’ll definitely forget where I planted them! I find it interesting that even though I sowed the seeds shallowly, most have migrated to the very bottom of their four inch pots. 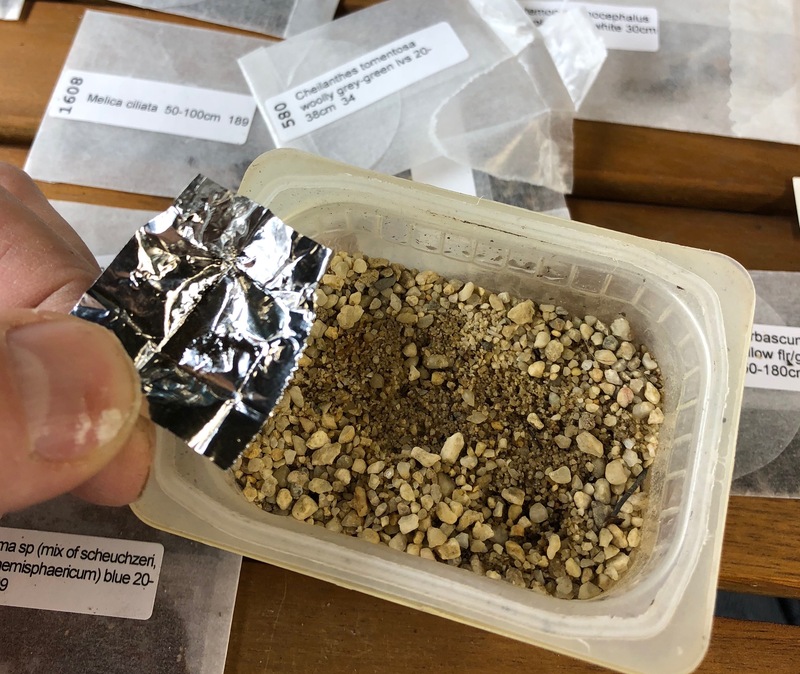 Readers of Ian Young’s Bulb Log at the Scottish Rock Garden Club will already know this since Mr. Young has observed this repeatedly, but for me to see it myself is of course more fun. I was also happy to find one of my fall snowdrops has made a nice sized offset. 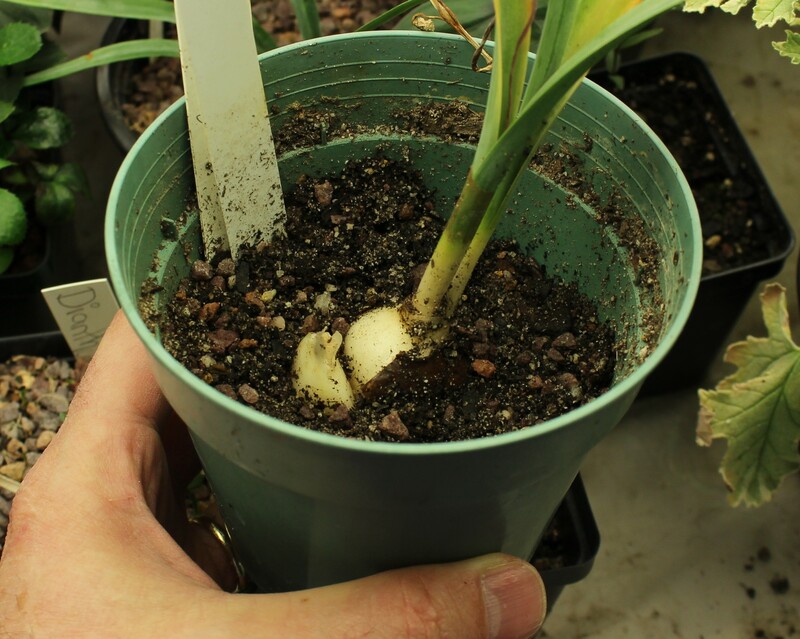 I would have thought the double shoot from the top would have split the bulb into two, but instead it has just sprouted a new bulb off to the side. So I guess that means there will be three growing tips next fall! One of my special snowdrops, a fall blooming Galanthus elwessi monosticus which a friend picked up for me at Nancy Goodwin’s Montrose Gardens in Hillsborough North Carolina. Not all my escape gardening happens in seclusion. Occasionally I have a helper and this year that helper has been assisting in writing out some of the many plant labels which go along with all the odds and ends which get seeded out. She may actually do a neater job than I do, and her talent for labeling in Latin is impressive. Also impressive is one of my newest treasures. 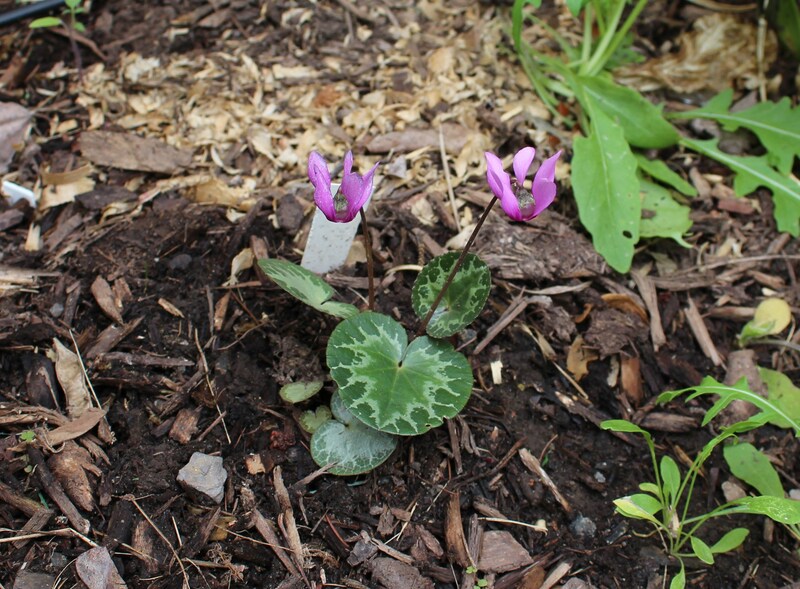 It’s a Cyclamen Rhodium seedling from my visit to John Lonsdale’s Edgewood Gardens, and it’s blooming in spite of having been dumped out of its pot not even three minutes after John handed it off to me. He was very forgiving of my clumsiness, but I never did mention that I dumped it over again a second time as I got into my car. Fortunately it survived, and although John suggested that I give this one a try outdoors in a sheltered spot (planted six or more inches deep once it goes dormant), I’m not sure if I’m brave enough to risk its health a third time. A really cool Cyclamen rhodium from the Southern Peloponnese and island of Rhodes in Greece. Nice flower but look at that speckled foliage!